Mike Russell, RVT, affords those with sick pets an option for assisted care for the animal in the comfort of their own home. 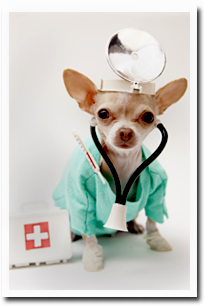 AAHA's website for pet owners. Guides and reviews of popular dog foods. Guides and reviews of popular cat foods. This is the largest organization designed for the protection of domestic and wild animals and they rely on donations from good people like you. Northeast Animal Shelter A respectable shelter for homeless pets that I've donated to for years. The American Kennel Club Breed registry for purebred dogs in the United States. Working to advance the study, breeding, exhibiting, running and maintenance of purebred dogs. Working to protect marine mammals and their environment. See what creatures are in the hospital! The Physicians Committee for Responsible Medicine is a nonprofit organization that promotes preventive medicine, conducts clinical research, and encourages higher standards for ethics and effectiveness in research. No matter where you're going, BringFido.com can help you find a pet friendly hotel for the trip. Rod is a local trusted and skilled photographer. I highly recommend him, especially for weddings. A local pet grooming shop that I recommend, owned by Kristin Hrenkevich. A local yoga studio that I have practiced at over the last 2 years. The owners and staff really care for their fellow yogis. The ultimate all natural, family owned, doggie treat haven. Greg and Scott really take care of their customers and I have been going to them for almost a decade. A non profit organization serving the city of San Clemente and Dana Point. The city's animal shelter home page. Amanda is a bubbly local who creates colorful paintings and also paints clothes & accessories.